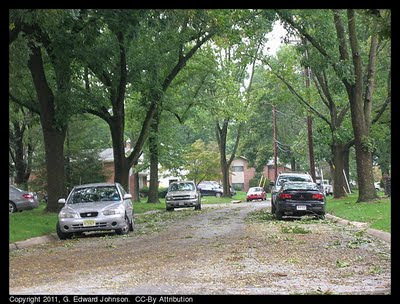 My last post talked about how Irene took it easy on us and Pepco did a better job than usual keeping the lights on. I think I was a bit hasty on both counts. I lost power this afternoon for almost an hour, yeah, during the sunny, calm part of the day. Also, I've seen a bit more damage, I'll start with the most visually impressive. This house on the corner of Greentree Road and Old Georgetown Road near NIH really got clobbered. A tree fell right across the center of it, totally ripping through the attic. The tree is now gone and there is just a gaping hole in the roof. I see there is the red sticker saying this house isn't suitable for occupation on the front door. 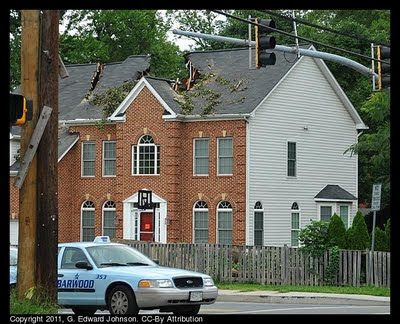 Next to this house there is a large, white SUV that I always see and wonder how they get such a big vehicle in such a little parallel parking space, a tree fell on it too, partially crushing the roof (Bethesda Patch has some photos of it, and other storm damage). 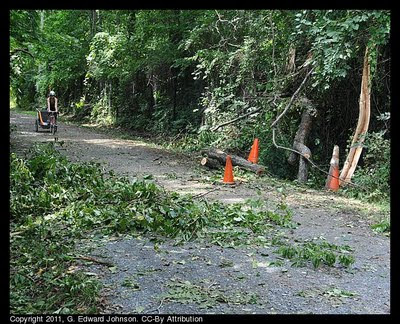 Last post one of the commenters noted that a tree had fallen across the Capital Crescent Trail at the country club. I took a walk there over lunch and it had been partially cleared. You could walk or bike through without slowing down, but there were still some largish bits of tree on the trail. Twitter user @kangkanglanlan posted this image of another car hit by a tree in Bethesda. 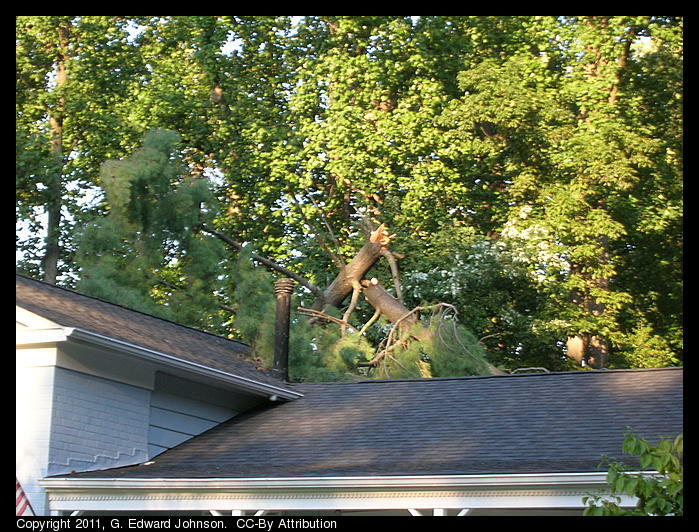 After all the news leading up to Hurricane Irene's arrival in Bethesda, MD, it turned out not to be so bad. There was rain, but not too much. There was also wind, but again, not too much. Pepco's tree trimming campaign must have had some effect because there weren't even too many power outages. 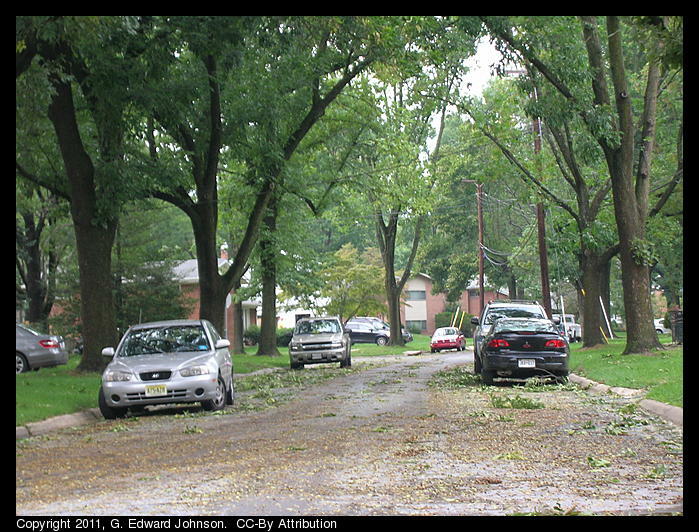 I drove around this morning and lots of streets had extra leaves and small branches on them, the picture at the top is a pretty typical example. There was a bit of damage though, this house had a pine tree fall on it, that tree then broke off and the top also fell on the back of the house. I didn't think it would happen this fast, but I am actually getting used to the earthquakes. Last night at just after 1am there was another earthquake. It was fairly large for the area at 4.5. I woke up, felt the bed rumble, heard all the pictures rattle and thought to myself, hey, an aftershock. I then went back to sleep. I didn't think of getting up and checking on the house at all. A year ago I would have been awake with adrenaline pumping for hours. 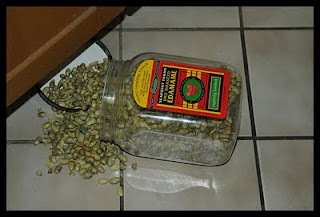 Today, at 1:51pm we had an earthquake. As east-coast earthquakes go, this was big, a 5.8, and it lasted a long time too, it seemed to be about 45 seconds. Fortunately, there wasn't much damage, but over-reaction mode was in full effect, lots of office buildings closed, all the DC monuments closed, Metro ran at 15 miles an hour (until 10pm when it went up to 30 mph). I was at home when it happened and after about 10 seconds it started getting stronger and I decided to exit the house. But then I went back in, its hard to decide which place is safest. Earthquakes are rare around here, but they do happen. There was a 3.4 quake in Gaithersburg last year, and there are quite a few that are too small to feel. Yeah, not much. There was also stuff knocked of shelves but no damage. 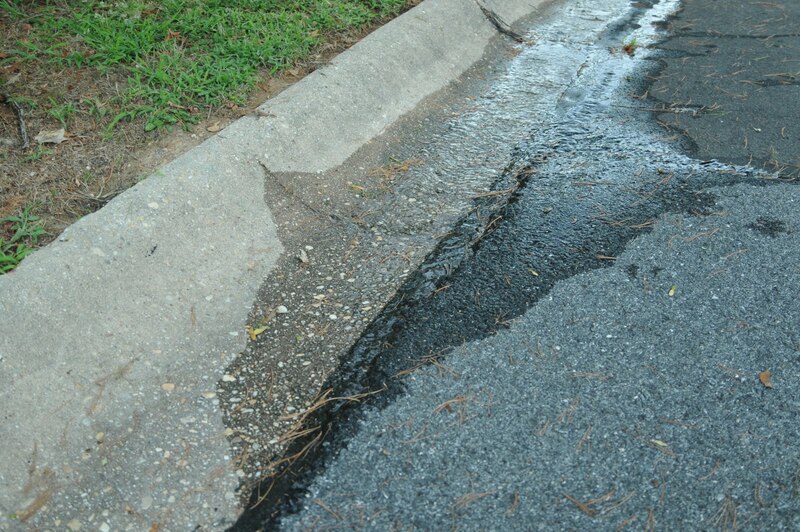 A few hours after the quake I found another bit of damage, a water main break in the neighborhood. Again, nothing big.